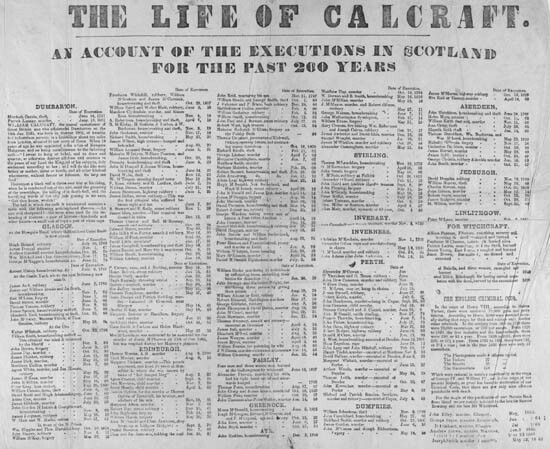 This broadside begins: 'AN ACCOUNT OF THE EXECUTIONS IN SCOTLAND FOR THE PAST 200 YEARS.' The reader is provided with an alphabetical listing of the places of execution within Scotland, under which the names of those executed, along with the nature their crimes, are placed chronologically. Also provided at the end is a separate listing for the crime of witchcraft and a brief insight into 'THE ENGLISH CRIMINAL CODE', including a few interesting statistics. William Calcraft (1800-79) was the general executioner of Great Britain, and the first English hangman to conduct executions in Scotland following the death of John Murdoch. He worked in Scotland between the years 1852 and 1870. A brief biography of Calcraft is given at the beginning of this account. This broadside offers a fascinating insight into crime in eighteenth- and nineteenth-century Scotland. The names are many and include such notorious figures as William Burke, who was executed in Edinburgh on the 28th June, 1828, and Robert Edmond, who was responsible for the Haddington murders and was executed in Edinburgh on the 17th March, 1830.